The Sealed System by Bingham & Taylor consists of a Valve Box Stabilizer and a Debris Trap, which are available together, or separately. The Stabilizer has the highest versatility, fitting all round valve box bells and bases, for use with either cast iron or plastic valve boxes. It is highly effective in preventing the intrusion of dirt, backfill, or sand from below. 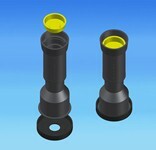 The patented design assures proper alignment of the valve box and protection of the valve. It also assures that all “down” force is transferred to the back filled area, rather than to the buried valve or pipe. It eliminates the need to “block up” the valve box. The Debris Trap component of the Valve Box Sealed System was engineered to eliminate maintenance and service issues caused by debris intrusion through and around the valve box top over time. The Debris Trap design is also responsible for the system being “no vac” because it eliminates the need to vacuum out the box prior to actuating the valve. The Debris Trap is designed to fit domestic and imported valve boxes, both plastic and cast iron. It is manufactured from utility grade ABS plastic, which is ideal for applications that demand high surface hardness, rigidity, impact strength and overall toughness for utility maintenance products. The Bingham & Taylor “No Vac” Debris Traps are manufactured in yellow and black, paintable and markable with standard indelible markers, and are proudly manufactured in the USA.